December 2016: “The Mighty One has done great things for me, and holy is his name. His mercy is for those who fear him from generation to generation.” (Luke 1:49). May God’s mercy be our strength and sustenance in the season of Christ’s birth. Click here to view a Christmas greeting from MWC. December 2016: Lord, amid the troubles of this world – an earthquake in Indonesia, unjust government and election postponement in DR Congo, a president impeached in South Korea and Brazil, ongoing war in the ancient cities of Syria and Ukraine, currency devaluation in Venezuela, and ongoing land rights struggles for indigenous people around the world, in addition to the personal pain of sickness and unreconciled relationships – we long to experience your good news of great joy. Bring your peace to our circumstances, Lord, and may your kingdom come on earth as it is in heaven. Teach us to follow Jesus with goodness, righteousness and truth. November 2016: In the aftermath of a polarizing election, pray that USA churches would offer a bold, creative, courageous witness to the gospel. May Christians respond to the real fears that cause protectionist thinking with a gracious spirit and trust in God, knowing their brothers and sisters around the world walk with them in prayer. November 2016: “Mak[e] every effort to maintain the unity of the Spirit in the bond of peace. There is one body and one Spirit, just as you were called to the one hope of your calling, one Lord, one faith, one baptism, one God and Father of all, who is above all and through all and in all” (Ephesians 4:3–5). Pray that MWC member and associate churches would develop relationships of mutual trust. May we live our calling to the unity of the Spirit through transparency, accountability, information sharing and giving among our churches, conferences and international partners, so the gospel may be spread and the name of Christ exalted. October 2016: The Integrated Mennonite Churches of the Philippines ask for prayer for their country. The new president has taken many bold and controversial approaches, polarizing opinions in the church and creating a culture of fear. Pray that local and national leaders would be wise and discerning under pressure from many influences; that people would unite for the sake of their land, for their children and future generations; and for the common welfare and shared future of the people. Pray that the body of Christ in the Philippines will be united in pursuing justice, peace and human rights. May the church overcome through the power of the God of justice and peace, the God of history. Click here to read a letter calling for prayer by Regina Mondez, National Coordinator of Integrated Mennonite Churches, Inc.
October 2016: On 31 October 2016 in Sweden, the Lutheran World Federation and the Roman Catholic Church will jointly hold a commemoration of the Reformation, in anticipation of the 500th anniversary of the Reformation. Praise God for this joint worship by two world communions. As general secretary César García participates on behalf of Mennonite World Conference, pray that God continues to work on the reconciliation of his church for a better witness to Christ in the world. October 2016: As a global church, we pray for our brothers and sisters in Haiti. The Mennonite community in Haiti was affected by hurricane Matthew. Pastor Lesly Bertrand writes: We have two churches in the South that are completely destroyed as well as two others on the central plateau, and hundreds of houses of our church members are destroyed across the country. Two of our pastors are homeless. Once more, we rely on your prayers and understanding! MWC’s World Directory mentions over 5,500 members in 58 different churches. Lesly is part of the union of churches of the Assemblée de la Grâce, which is made of 20 churches. Two francophone Mennonite organisations, one French, the Caisse de Secours, and the other one Swiss, the Services Missionnaires Mennonites, are joining the call for donations initiated by MCC Haiti. September 2016: “How long, O Lord?” We as a global church along with our churches in DR Congo utter the cry of the psalmist as violence and political disagreements erupt in Kinshasa before upcoming elections. Pray that the leaders of DR Congo would be motivated to make wise decisions and to govern the country in justice and for the flourishing of its citizens. Pray for churches who carry a message of hope and peace – not only from physical violence but also from the darkness in human hearts. “Let them turn away from evil and do good; let them seek peace and pursue it. For the eyes of the Lord are on the righteous, and his ears are open to their prayer” (1 Peter 3:11b–12a). September 2016: Pray for Anabaptist churches in Europe as they seek to articulate Christ’s way of peace. May they overflow with Christ’s compassion as they minister to refugees and their communities. September 2016: Praise God for recent steps taken by Muslim leaders to counter extremism and encourage acceptance of diversity in their contexts. The Indonesia church in particular celebrates the Jakarta Declaration and hopes that trust built between Christian and Muslim communities will continue to deepen so harmony and sharing at a cultural level can lead to talk about spirituality and mutual respect. Pray for the Indonesian Mennonite churches’ effort to promote peace and toleration in the society. August 2016: Brazil is dealing with an unstable government, trying to recover from economic crisis and preparing for the Olympics, all at once. Pray for the Mennonite churches who are wrestling with how to respond to these political challenges from a biblical, Anabaptist, peace perspective. Pray for wisdom and righteousness as some Mennonites join protests against government corruption. As the Olympics bring people from around the world to Brazil for displays of sportsmanship, pray for integrity among the athletes and fans. Praise God for the opportunity for churches to offer hospitality in the Spirit of Christ. August 2016: Zimbabwe cries out for restoration. The churches pray for repentance, peace and healing; that the spirit of unity will prevail among the country’s citizens and leaders. We pray that the unemployment rate (over 80%) will decrease. We pray for job opportunities, particularly for the young people. We pray for restoration in the economic sector. We pray that poverty will be eradicated. Earlier this year, a dry spell adversely affected crops and livestock in our country; yet the church continues to give thanks because “the Lord your God…goes with you; he will not fail you or forsake you” (Deuteronomy 31:6). May the Body of Christ be a refuge for all those who are lost, and may we journey together as we grow in faith, placing our hope in Jesus Christ, the owner of all the silver and gold. July 2016: Praise our Lord Jesus Christ for the historic signing of a bilateral ceasefire between the FARC (the Revolutionary Armed Forces of Colombia, a guerrilla movement) and the government of Colombia. This agreement includes specific plans to demobilize and reintegrate FARC fighters and is an important step toward signing the final peace accord. May God provide wisdom and guidance in this process to end the 52-year armed conflict. We pray for strength for the Anabaptist churches and agencies in Colombia who are committed to work for peace. May the Holy Spirit continue to light the way to a lasting peace, in the midst of conflicts with other armed actors. July 2016: Together, we give thanks to our Lord for the service of young people in the YAMEN program. In July, these volunteers return to their home communities and churches while new young people prepare to start their year of service in August. We pray that the Holy Spirit may guide them through this time of transition, of returning and departing. YAMEN is a joint program of Mennonite World Conference and Mennonite Central Committee. Click here to read more. July 2016: Pray for northern hemisphere schools in their season of summer holidays. Pray that the break from regular schedule would be refreshing for students and teachers. Praise God for camps and day programs which provide a safe place for children to have fun and learn about Jesus. June 2016: Pray for Venezuela which is suffering materially and financially with an unstable economic, political and social situation. People are suffering from shortages of food and staple items. Protests representing rival political perspectives cause added unrest. “There is much to overcome and still face in order to rebuild this nation,” says Daniel Aponte, president, Iglesia Evangélica Menonita ‘Shalom’ Venezuela. “We remain trusting in the Lord and know that only he can change things.” Pray that the church would live the gospel amid the uncertainty. June 2016: Praise God for travelling mercies. Mennonite World Conference leaders represent churches spread out over vast territories; travel for fraternal visits often involves uncertain terrain with unreliable transportation. Praise God for opportunities to worship and fellowship face-to-face with brothers and sisters in the Anabaptist family despite these difficulties and to encourage one another, as MWC regional representative for Central/West Africa, Francisca Ibanda, and Africa Executive Committee member, Steven Mang’ana recently did on a church visit in Burundi and DR Congo in May. May 2016: On 13 May 2016, two Brethren in Christ church members in Monsapur, Nepal, were beaten badly and most of the church windows were broken. This violence from religious extremists occurred after the church concluded a gospel-sharing program attended by hundreds of people from surrounding villages. Attempting to stop the vandalism, two church members were beaten badly, one with a broken nose and one kicked in the face and chest. They are being hospitalized and getting treatment. Both have families who depend on their daily wages. Please pray for their complete recovery. May 2016: Pray that young Anabaptists may develop a deeper relationship with God and will bear fruit in their church, community and nation. Pray for boldness to live and die for the Kingdom of Jesus Christ. 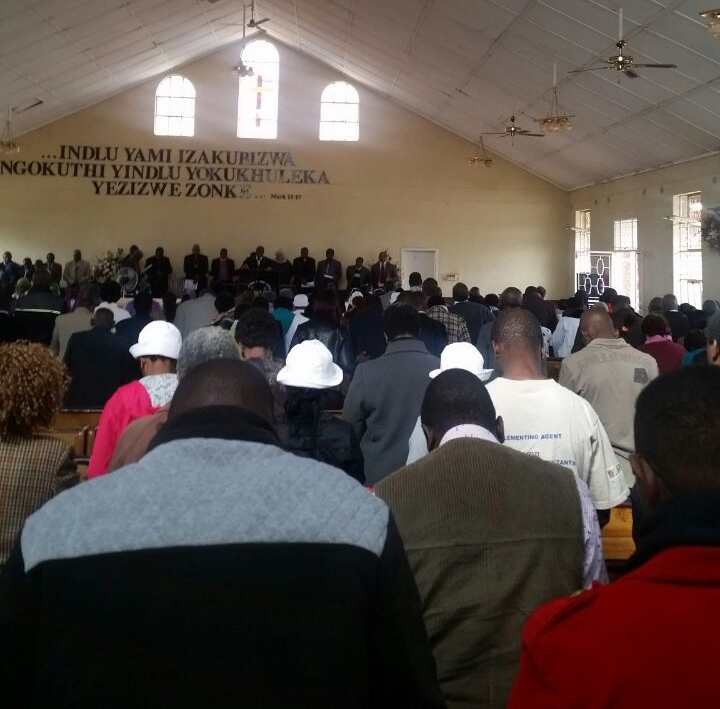 These prayers for Zimbabwean youth that Makadunyiswe Ngulube submitted for the YABs Fellowship Week are on the hearts of the Anabaptist family around the world. Praise God for the young people who will fellowship, learn and edify each other together via online tools during YABs Fellowship Week, 19–25 June. Click here for more information. May 2016: Pray for regions of Southern Africa affected by severe El Niño weather patterns. Swaziland, Zimbabwe, Lesotho, Malawi and Mozambique have declared national drought disasters and called for international assistance, and Ethiopia has also been affected. Crop failure food shortages result in hunger and sanitation failure and can have long-term effects on food security and children’s education and nutrition. Praise God for agencies who are responding with aid. Pray for areas in the region who experience El Niño’s effects in excessive rainfall and resulting catastrophic floods. April 2016: Pray for the people of Japan affected by earthquakes 14 and 16 April 2016, in Kumamoto, Kyushu. Several dozen people were killed and tens of thousands are displaced from their homes. Japan Mennonite Fellowship will give aid to the affected region. "Please pray for our good help for uneasy people in Kyushu," writes Shintaro Okazaki, chairperson of Nihon Kirisuto Keiteidan (Brethren in Christ churches in Japan). April 2016: Angola is experiencing a yellow fever outbreak of epidemic proportions. Pray that government officials would make wise decisions regarding use of vaccines to control the spread of the mosquito-borne virus in affected regions and to prevent transmission to neighbouring areas like DR Congo. Pray for hospital workers who are stretched to capacity. Pray that the church may be present among the suffering, helping to promote sanitation and accompanying those who grieve lost loved ones. MWC member congregations have also been affected, suffering illness and death. March 2016: Christ is risen! He is risen indeed! “You know the message he sent to the people of Israel, preaching peace by Jesus Christ – he is Lord of all” (Acts 10:36 NRSV). At Easter, we praise God for the resurrection and pray that we would be faithful in proclaiming God’s lordship through our words and our lives. As we celebrate with joy, we pray for our brothers and sisters in parts of the world we cannot name for their safety who are unable to celebrate openly due to persecution. We pray for their comfort with the words the LORD spoke to exiled Israel in Jeremiah: “I have loved you with an everlasting love; therefore I have continued my faithfulness to you” (Jeremiah 31:3 NRSV). February 2016: Pray for our MWC Executive Committee, YABs committee and other MWC leaders and staff who are having meetings in Indonesia from 10-22 February. May our God of peace give them wisdom and strength as listen, discern together and make decisions. Click here to see more about the MWC Executive Committee. 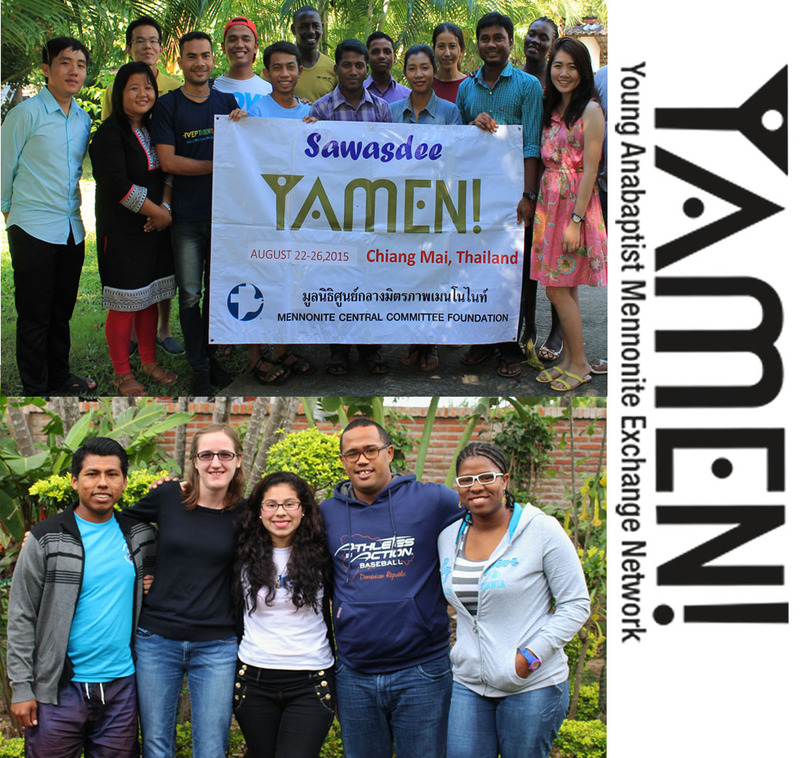 February 2016: We pray for strength and wisdom for the all young Anabaptists who are serving in the YAMEN Program around the world. In the middle of their service period, we ask God to keep shaping their lives and that they can be the hands and feet of Jesus in their service locations. We pray that they may never lose hope or motivation and that the desire to help their neighbour will increase each day. YAMEN is a joint program of Mennonite World Conference and Mennonite Central Committee. Click here to read more. January 2016: Pray for the Anabaptist churches and the people of Burundi. Since the declaration of President Pierre Nkurunziza’s third term in July 2015, the country has been in crisis with rioting and ethnic violence. Pray for God's peace to calm the hearts of the people who are choosing violence, and for the leaders to love the population and to lead the country in peace. 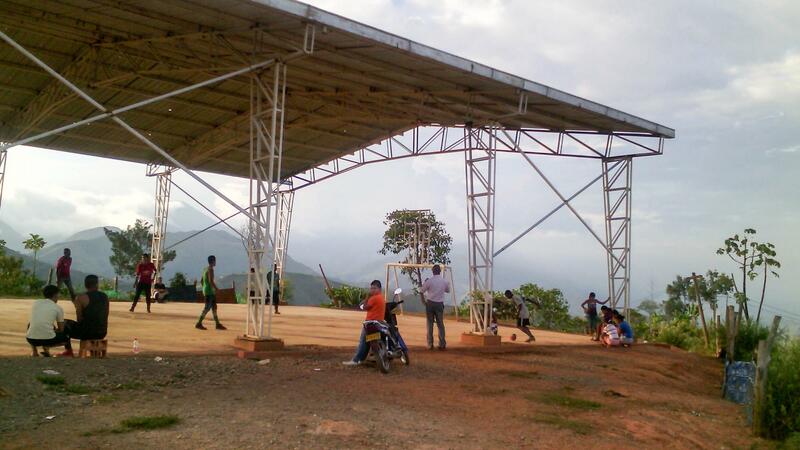 January 2016: We pray for protection and strength for the Mennonite Brethren church and entire community in La Esperanza, Colombia, where a violent confrontation between soldier and guerillas last April resulted in deaths and trauma. Pray that the church may be a witness to its neighbours amid the climate of fear and suspicion. Whether in Colombia or around the world, we pray that we may be faithful witnesses to Jesus Christ, announcing the gospel of peace under his lordship and inviting all to follow him. To read a psalm of hope from Colombian partners and background on the situation, click here.